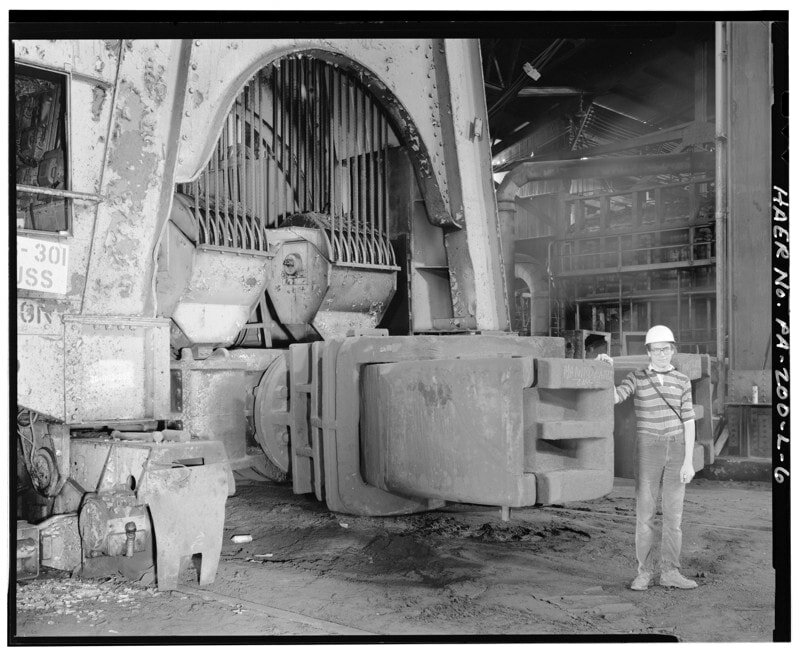 Large black-and-white photographs of old machines are some of the most popular posts in the work crews thread, so I figured they merited their own thread. Specifically, large high-quality images that we can enlarge, examine, print, frame, etc. Click on an image for the fullsize version, then you usually click on it again in your browser to see it at its maximum size. The Library of Congress website is a good place to search for these. For a specific image, you can check the download options (in the lower-left corner of the photo frame) to see if there's a large filesize photo available for download. A good start is the 50,000 ton Wyman-Gordon press, constructed in 1955. Grafton, Massachusetts. Thanks Jon I may have to buy spare ink for my HP design-jet 500 PS and a roll of 42" photo quality paper dig out my miter saw make some frames. Know any one with a surplus supply of old very large single pane windows I have a few 6 ft tempered glass ones double glazed but those things are next to impossible to cut without an oven to anneal them. I am amazed by the size of this machinery. What types of products would have been made? At the time of construction, this press (and a similar 50,000 ton forge press) were the largest tools ever created. The presses did (and still do) make lots of stuff, most notably airplane parts. Basically: per the Treaty of Versailles, which ended WWI in 1919, Germany agreed to surrender some its most valuable iron-producing regions that made steel. You can't really wage a war (let alone a World War) without excellent metalworking, especially in that era. Lacking steel, Germany figured out how to form magnesium, which was reasonably naturally abundant, although it had previously not been practical to form because magnesium is very fickle (prone to cracking, brittleness, etc.). Allied forces noticed these advanced magnesium forgings in downed Axis airplanes. 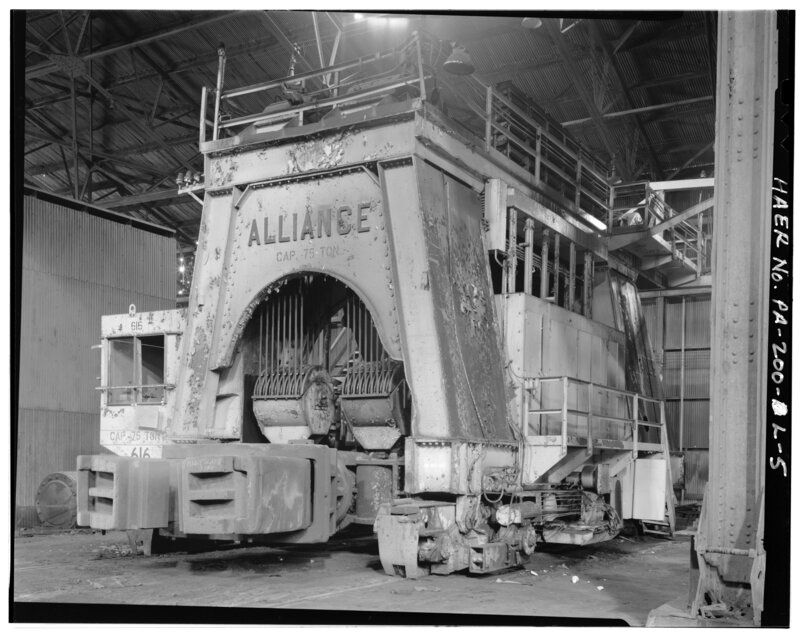 When Allied forces overran Germany, they saw the enormous forge presses that the Germans had built. When US and Soviet forces found these presses (and blueprints for more of them), they dismantled them and shipped them home. 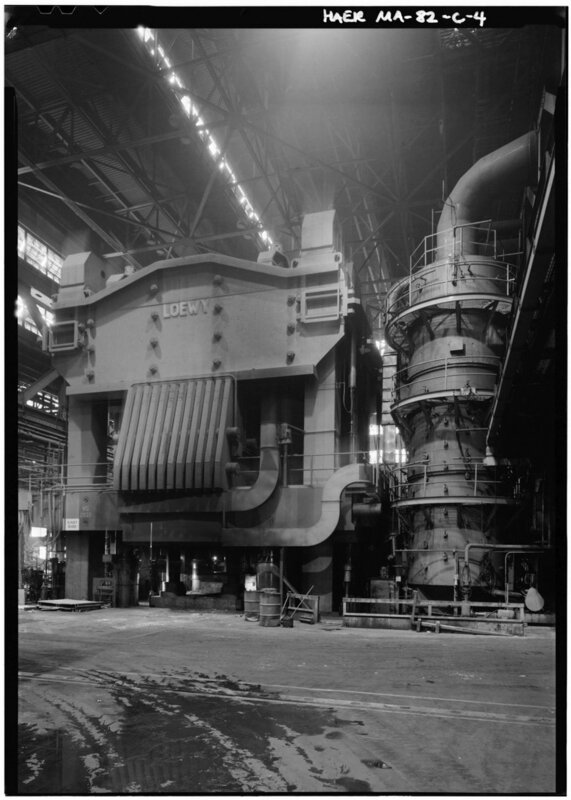 The Soviets got the largest press to survive the war (33,000 tons), as well as plans for a 55,000 ton press. 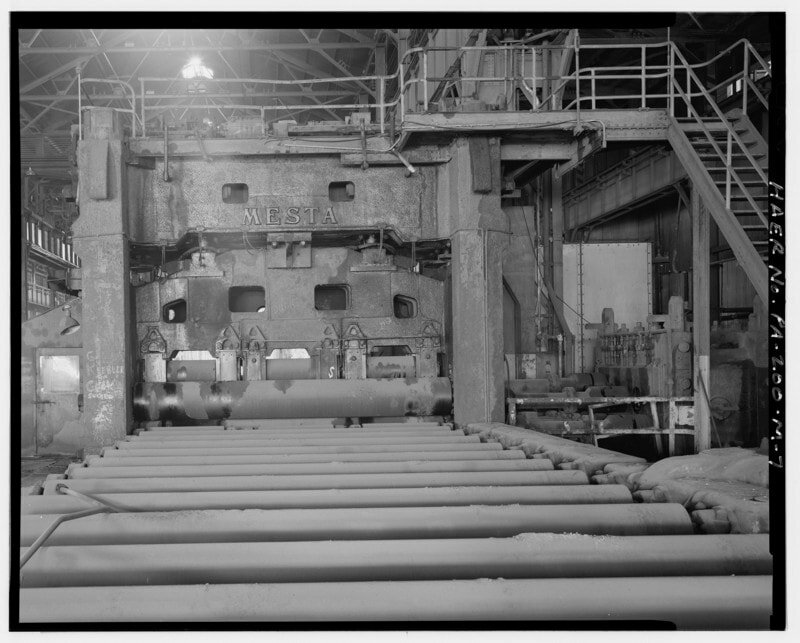 Under the Heavy Press Program, ten presses were built: six extrusion presses, and four forging presses. 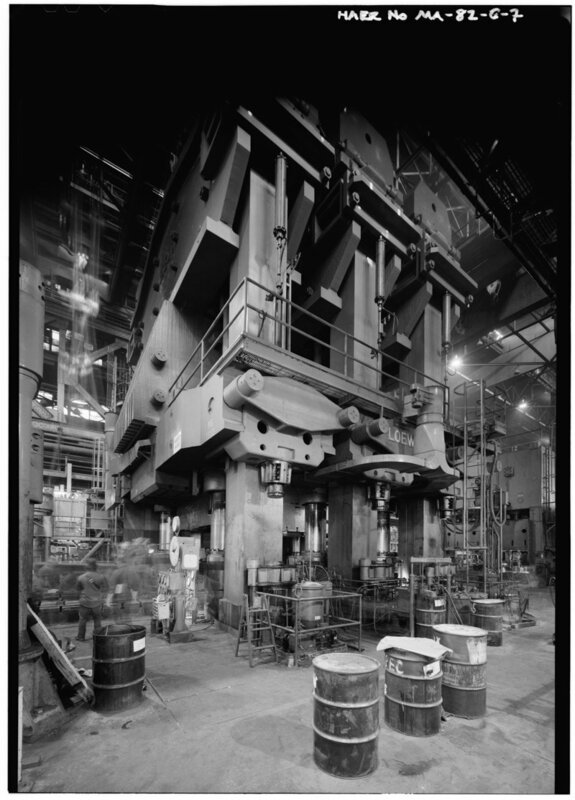 And of those four forging presses, two were 35,000 ton machines, and two broke the record for the world's largest machine. 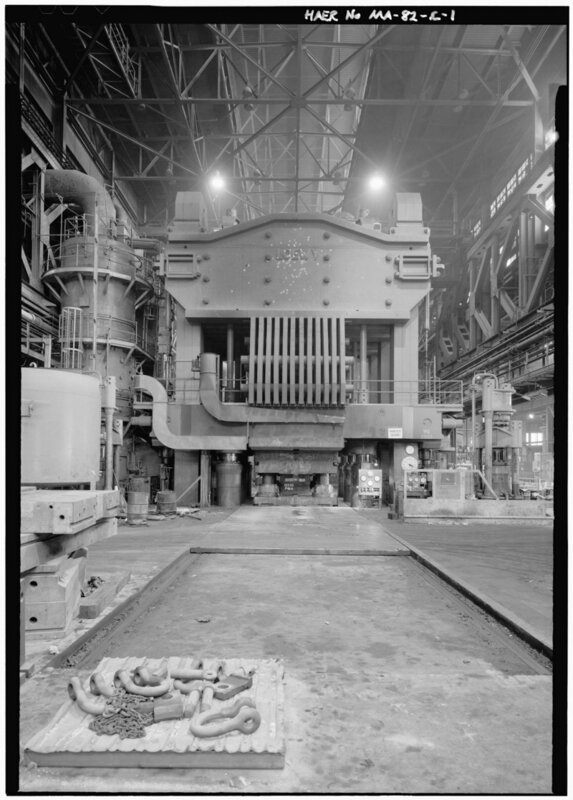 They were 50,000 ton press forges: the Alcoa Press and the Wyman-Gordon Press, pictured above. I don't care I still want one to sit in my front yard and crack walnuts with it. When I did my apprenticeship, the machine shop had, (amongst many other lathes) a quite large, czech made lathe, (I forget the name) that had been gifted to the Australian government after WW II, by the Germans as part payment for the war. It was a great machine, that was lovingly tended to by the shop foreman, and woe betide any smart young apprentice who didnt seek his express permission 1st before even cranking the saddle back to fit some stock in the chuck. If he didnt believe you were suitably experienced and adept already on the smaller lathes then you wouldnt even get a look in. FYI, I generally post 800px images for immediate viewing, and then the "fullsize" images I post are the largest versions I can find, that I then convert to jpegs. If you want the highest-quality image, for offline reproduction, you can also search at the Library of Congress website. Some of these images are enormous high-quality 50MB+ tiff files. That is an impressive video, I guess that means I can't get one for my front yard. Maybe I can call my congressman and see if He can get Congress to authorize the building of the 200,000 ton press in my back yard Just in case they ever need it. If a nut that holds the Mseta 50 together weighs 55 tons how much does the box end wrench that tightens it weigh? Each of these beautiful giants is accompanied by numerous specially-built tools for construction, transport, assembly, maintenance, operation, etc. Everything starts with an idea. Someone wakes up thinking I'm going to build a 50,000 ton press. His first problem is there are no furnaces or cauldrons large enough to melt the iron for the castings there are no forging hammers large enough to forge the parts no lathe exists to machine the shafts nuts bolts pulleys gears ETC. No materials handling equipment to assist in the movement of these large items. The only way these behemoths can become is smaller equipment has to be used to make ever increasingly larger equipment until one day 60 to 90 years later we get to enjoy looking at a black and white picture of a mechanical wonder of the world which has been in operation since before many of us were even born. Last edited by Frank S; 10-11-2018 at 08:27 PM.